Before construction, Wichita State’s Wiedemann Hall was a dirt lot without a claim to fame. But now, for 30 years, Wiedemann Hall has proudly housed a Marcussen Organ, the first ever manufactured in the United States. 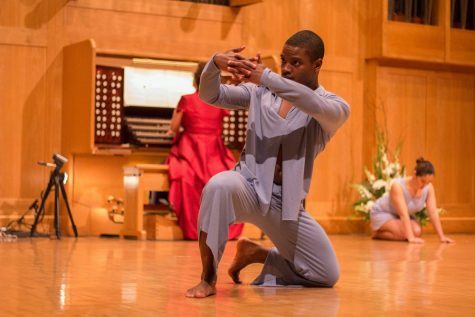 On Tuesday evening, to celebrate 30 years of Wiedemann Hall and the Marcussen Organ, WSU hosted a Gala Celebration Concert, featuring choreographed dancing, musical performances and ceramic sculptures. All three College of Fine Arts schools were represented in the event. Robert L. Town Distinguished Professor of Organ Lynne Davis played an organ solo on stage for the first portion of the show. After intermission, she was joined on stage by a group of dancers. The dances were choreographed by Regina Klenjoski of the School of Performing Arts. The stage was decorated with three large ceramic works built by several ceramics students in the School of Art, Design and Creative Industries. “This is not a multi-media event – it’s actually more of a multi-medium event,” said Dean of the College of Fine Arts Rodney Miller. The second half of the show was where the event hit its stride of intertwining arts. Davis performed Trois Danses, one of Jehan Alain’s most famous works. The piece is broken into the three dances of life, Joies, Deuil and Luttes: the leaping joys of childhood, learning grief and mourning in the mature years and the struggle in life to surmount suffering. As Davis began to play the piece on the organ, six dancers – garnished in all light blue – emerged from the back of the hall and walked down the aisles, taking their places on stage. From there the organ concert became a conversation between the music and the dancers as they interpreted the goings of life on stage. The organ, normally associated with old ladies and church music, as Davis pointed out, was on full-display Tuesday night, showcasing the versatility of the instrument. It was fitting on a night that honored Rie Bloomfield of the Rie Bloomfield Organ Series and Robert L. Towns, whose name is associated with the distinguished professor of organ. Widener was able to appreciate the show largely because it was like nothing he had seen before in the 30-year history of the hall. Davis was thrilled to headline such a monumental event in which all three schools in the college played a part. Davis praised the dancers who auditioned and earned the spots on the stage and compared playing the organ to dancing, due to the ample footwork.